Zebrabar was exactly what the doctor ordered and there’s no doubt why it’s so popular with overlanders who have just crossed the Sahara. It is a campement right by the water with a choice of cabins. We booked ourselves into a lovely bungalow and parked the bikes in the soft sand right in front of it. We jumped in the water as soon as our bike kit was off and then joined the other guests on the long table for dinner. Everyone seems to be on the same wavelength here, and Ursula, Martin and their family make guests welcome in a very laid back, hands off way. We shared the table with a young couple from Luxemburg and a franco-canadian couple here to volunteer in a school. Present were also an Austrian couple who were about to begin a university exchange programme. They had a lot of very good advice about Saint Louis and Dakar. Fabian had wanted to overland it to Senegal but it didn’t happen. He did know all about temporary import of vehicles etc though… I had my first taste of a Gazelle beer which I can’t really tell whether its good or not (its been so long). It did the trick for me though! We spent the next 24h doing absolutely nothing except for swimming and reading. We had breakfast on the terrace overlooking the water and were greeted by local fishermen passing by in their colourful pirogues. We were actually very lucky because our first day in Zebrabar coincided with the visit of about 30 kids from a local orphanage. They were spending the day by the water and playing with the instruments and toys Martin has lying around. It may sound like a bad thing to happen when one is looking to relax but these kids were very well behaved and brought a lot of life to the site. We made friends with a few of them, doing tumbles in the water and showing them the bikes. We sat them on the bikes and let them rev the engine too. I know I would have loved that as a kid myself! Seeing their excitement was priceless. During our second day we focused on getting an extension on the 48h temporary import for our bikes. This was an interesting process to say the least… Apparently the local customs office won’t give you an extension (this is debatable though) and one has to deal with the infamous…let’s call him Mister M. Mister M is the son of an influential person in Senegal and he’s got connections… We were given his number and called him to arrange a meeting. We then waited on he terrace of the Hotel De La Poste when, an hour late, a car parked, doors opened and a smartly dressed businessman stepped out followed by an entourage of 3 minions. We shook hands, he asked what we needed and sent a minion away to make copies of our documents. When he came back the price negotiation started… Prices had come up compared to the usual rate. He explained that a third of it was for administration and the rest was for his effort. Louise began using her charm and bargaining skills and he got up and shook her hand at 38€ per bike for a 10 days extension. He then drove off with our paperwork and the promise to be back around 4pm. That left us a few hours to visit Saint Louis which is worth doing. It’s a long and narrow island which, like Manhattan is organised around a grid of streets. That’s where the comparison ends though… It did have some resemblance with another American city; New Orleans, with a certain French colonial feel and beautiful balconies on the first floor. The only down side to Saint Louis (and you’ll find this everywhere in Senegal) is the ‘touts’ trying to sell you everything from a horse cart ride to a kitchen sink. They are good at sticking to you like glue, asking your name and listening to what you’re after (this was actually helpful when looking for a Senegal flag for the motorbikes!). After a day of this and of street kids begging for money, we were pleasantly surprised to be greeted by a local guy who spotted our bikes and wanted to come and have a look. He was very friendly and wanted to hear all about our route because although he’s a teacher, he ‘lives for his motorbike’. It’s always nice to meet keen bikers! Upon our return “home”, we had the very pleasant surprise to meet John, a South African who was spending some time in Senegal waiting to meet with his son Anton and his girlfriend Tina who are driving from London to Cape Town. John was a chemical engineer who came up with a process to entirely recycle cardboard. He was now focussing on creating a totally sustainable farm which could support up to 40 people. Louise had a very interesting g conversation with him as they were totally on the same wavelength and she felt very inspired by him. He also told us about his son Anton who has a fascinating story. John and Anton had been on a biking holiday in Argentina a few years ago when Anton had a terrible accident in which he lost a leg. This didn’t slow him down though, as a matter of fact he embraced the change so much that he became an volleyball athlete. And an Olympian too! He’d just finished competing in the London games before setting off to cross Africa in a 4×4 with his girlfriend. Louise and I were very disappointed that we didn’t get to meet them but John very kindly offered to meet up next time we’d be in Cape Town, an offer Louise and I would love to take up. 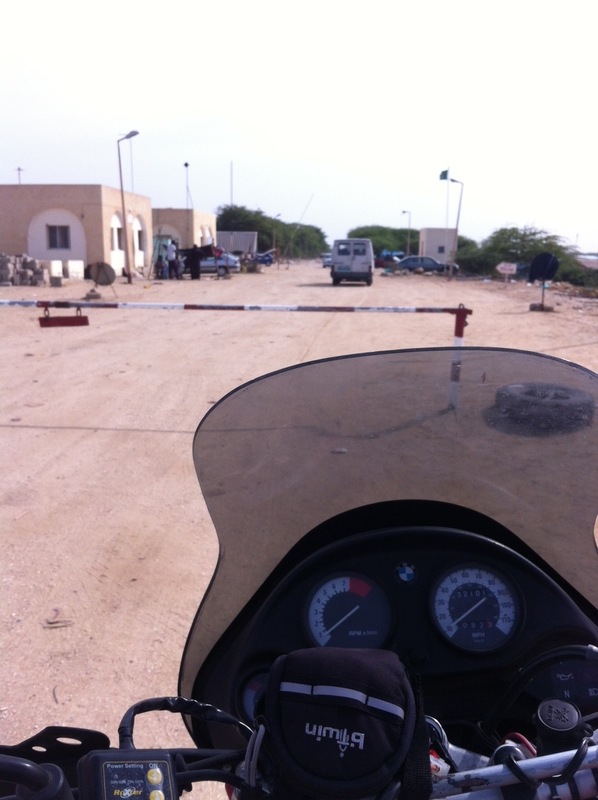 First we came across the Mauritanian gendarmerie who asked me for 10€ per bike. I was on my own because, as the man of the couple, they’d asked me to follow them into their office. I told him I knew this was corruption and he said yes, it’s not obligatory to pay but he’d be very grateful. Nice chap. So I gave him what Mauritanian currency I had left as he asked politely; the equivalent of about 2€ and he thanked me profusely. Next was the Mauritanian customs. They needed 10€ per bike to let us out… This time Bad Cop was in charge and after much huffing and puffing, and the officer explaining that he’d “been there since 8am so he needs to be paid extra” we paid him 10€. We even got a phoney receipt for it but he wouldn’t give us a bottle from one of the many cases of wine he had stashed in his office. The third part of the process was to deal with the Mauritanian police. 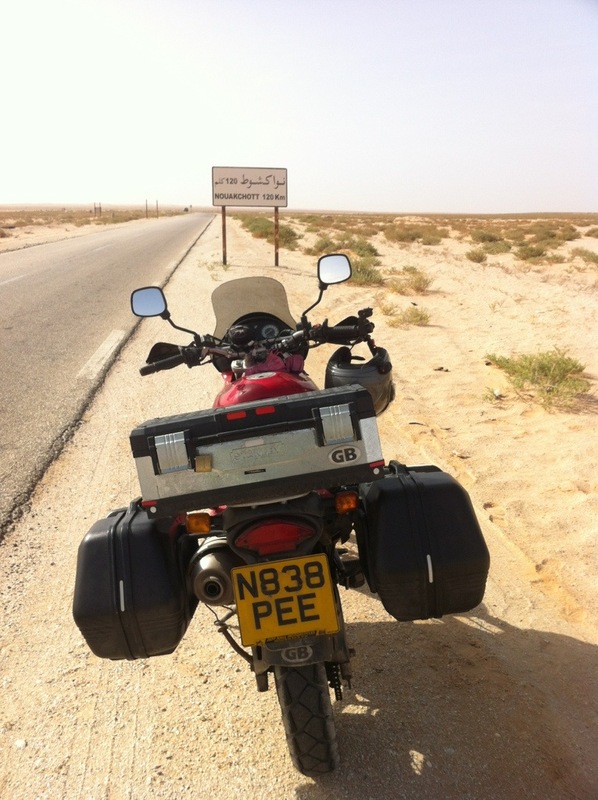 In order to get our passports stamped they needed 10€ per bike… Here both bad cop and good cop were outraged; how could a respectable service like the Islamic Republic of Mauritania’s police be as corrupt as the gendarmerie and the customs?? Louise caught one of them grinning and pointed it out. In the end they said “this is the Mauritanian police, you won’t be given trouble by us, please be on your way and bonne route”. 0€. Now came the Senegalese side of the border. But first we had to pay a fee to cross the bridge. This was to be paid either in CFA or in Euro, but it was twice as expensive in Euros. We didn’t have CFA so we were shown where we could get them changed; passed the customs and police, inside the coffee shop. 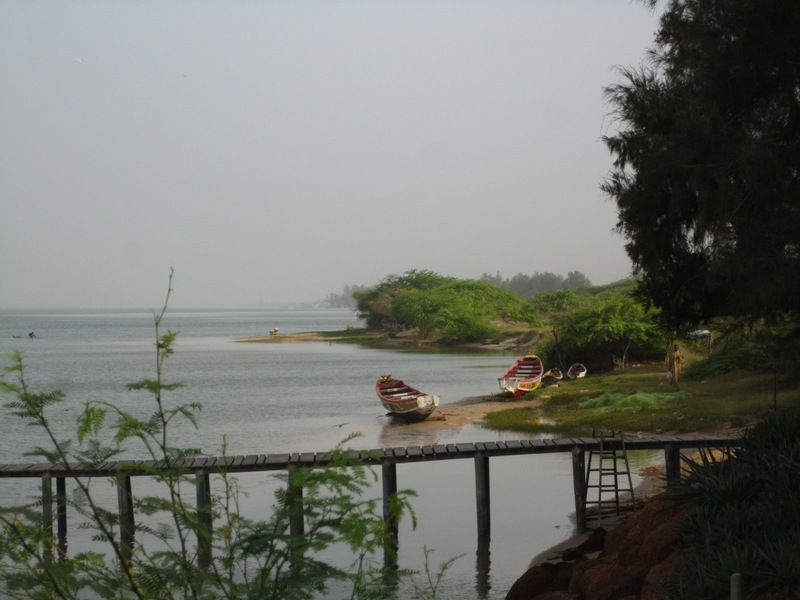 Here we were, walking into Senegal with no one even seeing us, let alone caring. If it wasn’t for the bikes we could have continued walking all the way to Saint Louis! Now that the bikes were on the Senegalese side of the river we had to contend with the Senegalese police. A very official man in a football outfit watching Arsenal playing Fulham on tv. We tried to hook him by talking football but he was a nasty one. He needed 10€ per bikes to let us in. “Its official, everyone has to pay”. There seemed to be a pattern here… He wasn’t budging and after we argued about us having a reservation or not for our first night in Senegal Louise became the good cop, said we were very sorry we didn’t have a reservation, picked my passport from his desk and pushed me away. He had already stamped everything and he was missing good action on TV so we walked away without giving him a dime. We’ll done Louise! 0€. The last official process was to get a temporary import for the bikes. This was to be done at the customs and I was concerned about this. I had read many different and conflicting tales about how, without a carnet de passage for the bikes (warranty paid at home) we could be made to pay a high price. I had also read that they didn’t give “passavants” to bikes older than 5 years old. But to our surprise the custom officer was very friendly and professional and gave us a 48h temporary import document for which he asked the equivalent of £12 for both bikes. Seemed legit to me. We had to get it prolonged in Dakar or Saint Louis as he didn’t have the authority to give us more time. We now went back to our friend the coffee shop owner/currency exchange agent/ lady who bosses everyone around to get our very official looking insurance documents for the bikes. This lady was extraordinary, she wore a beautiful African dress with big sun glasses, two mobile phone and a calculator. She was obviously in charge as she shouted orders at the “helpers” who hung around there. She was very nice to us but she was a keen business lady. The cost of insurance for 10 days was the equivalent of 30€ for the two bikes. We’d done it! 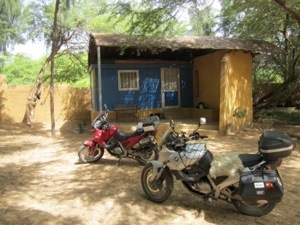 We were in Senegal with our bikes! What a relief. And what a contrast too; the road was in perfect condition and the 30km to Saint Louis were a breeze. So many things were different on this side of the border; we saw many young men jogging along the road, lots of women (had hardly seen any since entering Western Sahara) wearing exuberantly colorful dresses and jewelry. The vegetation was lush, bananas were growing on trees, and roadside traders were selling all sorts of beautiful fruits. We were waved through checkpoints by gendarmes who gave us a welcoming salute and a big smile. After crossing Saint Louis, on our way south to the famous Zebrabar, we came across a colony of apes jumping across the road and into the bush. 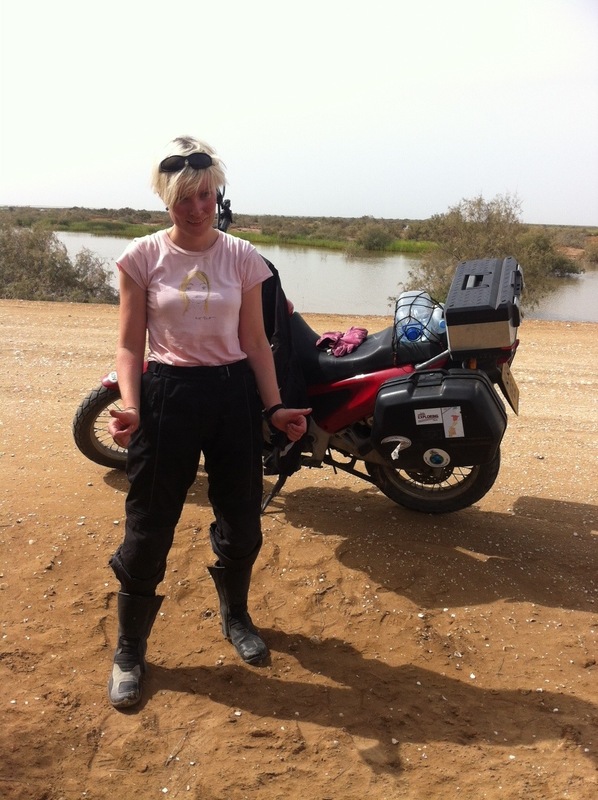 After weeks in North Africa and in the Sahara we were now truly in West Africa! 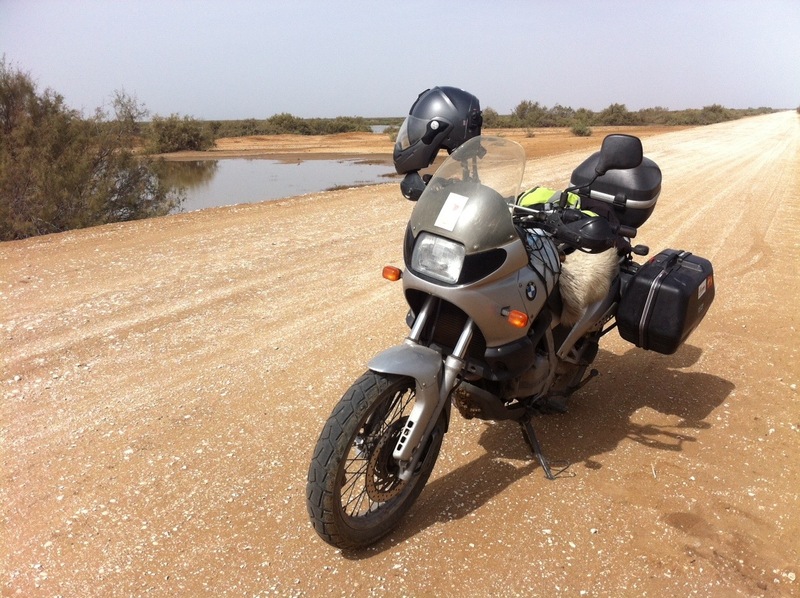 “150km south of Nouakchott, turn right after the water tower” said one man… it took us a while to find the shortcut but did so eventually. This was after a stop to refuel in a small market village on the way. The fuel pumps looked new but weren’t working. Thankfully the owner had some barrels at the back and we bought 10 litres of his finest “sans plomb”. It was comedy though when he asked me to hold the barrel high above the bike while he sucked the petrol out of a length of hosepipe; he wasn’t very competent at this as he did get a couple of mouthfuls. What wasn’t comedy is when he spilled petrol in Louise’s helmet which was hanging upside down from the handlebar… Schoolboy error. Louise had to stop a couple of km later as she felt her forehead burning and we proceeded to wash her helmet liner with shampoo by the side of the road. 24h later her hair still had a faint petroleum scent to it. Does this make her a ‘petrol-head’? All this delayed us and we only made it to the shortcut around 11am when the sun started beating down on us. The track wasn’t as good as we’d been told. In fact there were two tracks. One was an old track made of dried mud and patches of soft sand, the other was a road under construction which was composed of packed gravel and white sand… We battled with the first track, then tried our luck with the road under construction but the further we went the softer the sand became. I was really impressed by Louise’s riding skills in soft sand, she was nimble and did good progress. I, on the other hand, was trying too hard and battling against the bike. I exhausted myself to a point at which I actually became quite worried about my health; I was out of breath and overheating, there was no way I would make it to the end if I continued like this; I was on the verge of a heat-stroke. We took a 20 minutes break under a tree, I stripped down to my undies and cooled down. The 6 litres of water we were carrying were now down to about 1.5L. Louise then did a recce and found that the mud track which was running parallel was now better so we crossed over to that one. It was indeed easier to ride on but still challenging. 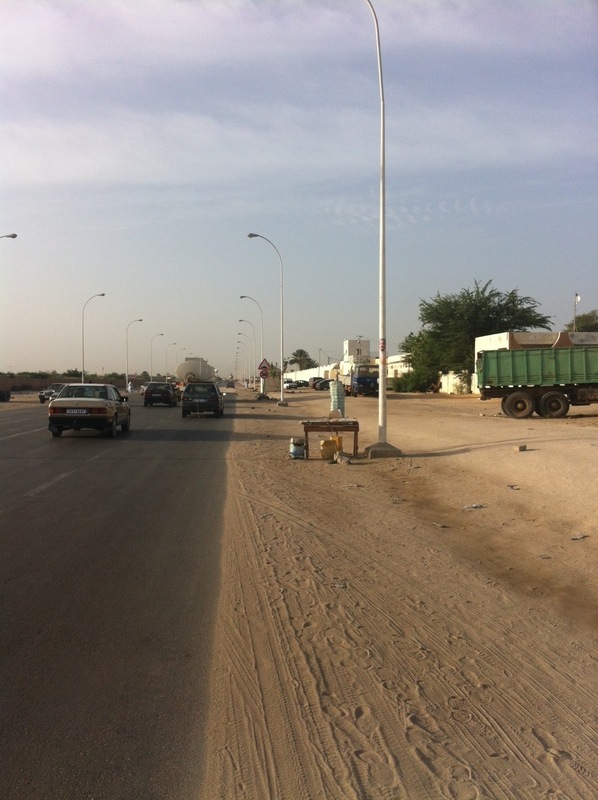 Nouakchott is interesting to say the least, an experience in itself. It is the capital city of one of the five poorest countries in the world, where a scandalous proportion of the population lives in slavery. There seems to have been absolutely no urban planning and the few tarred roads we rode on had potholes the size of a small car. I’ve been in many poor countries before and there is always an interesting history to cities; faded glory or at least evidence of a semblance of organisation in their past, but not here. I can’t begin to describe how poor, bleak, hot and dusty Nouakchott is. 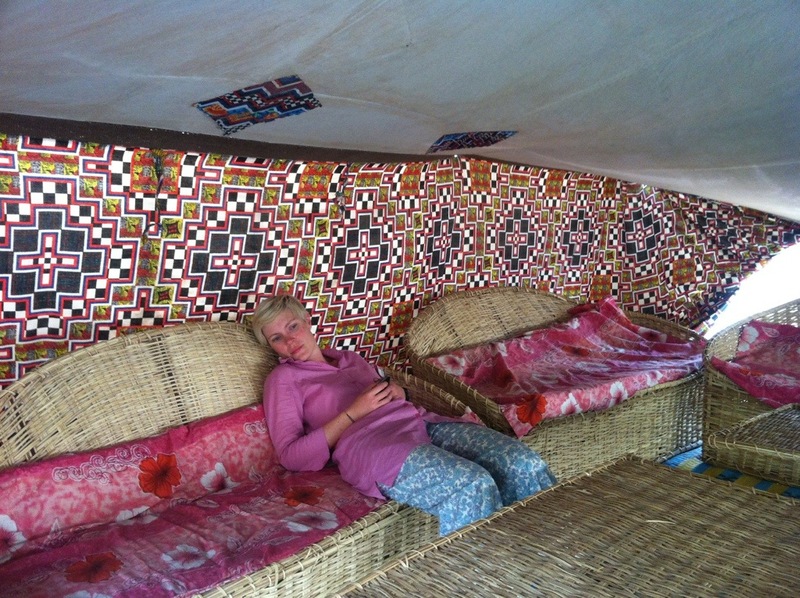 Thankfully we stayed in Auberge Sahara which is a little haven. They fed us a nice dinner of vegetables which we had been craving for a few days (there’s only so far one can go on white bread and omelettes). They also had air conditioning and loo paper; the height of luxury. Arriving in Nouakchott was very interesting; we weren’t prepared for the heat. I suspect it was in the high 30s Celsius, which is mild there, but nearly unbearable for us riding in all our motorcycle gear. We stopped at a petrol station and were surprised that the pump attendant wanted to buy our euros. Talk of confidence in the local currency! This was the second station we visited though, the first one didn’t have unleaded petrol and the attendant barely got up from the oil stained mattress on which he was napping, right by the pumps. He had been bothered a few moments before our arrival by a man on a camel… Was he picking up diesel for his car? We don’t know but it was funny to see a camel waiting at a petrol station.